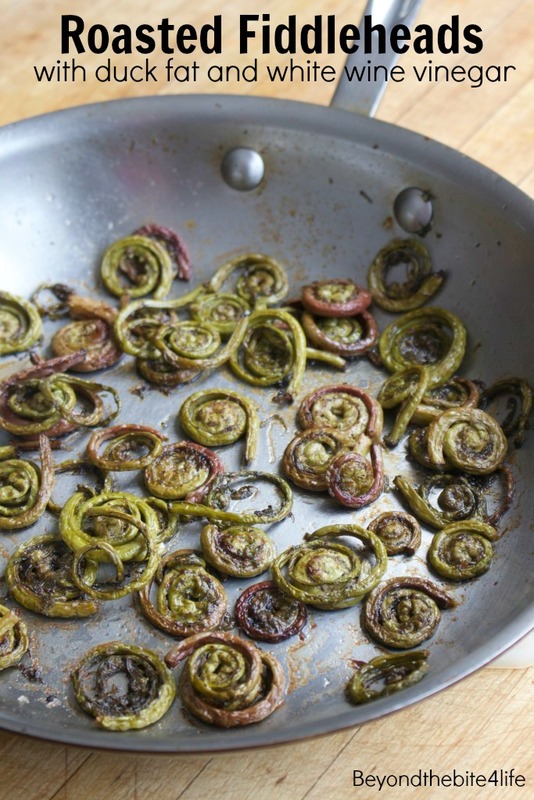 Fiddleheads are an ingredient seen only for a month or so in the spring and early summer. While these edible ferns remain rather a mystery to many individuals, they are truly not something anyone should be intimidated by. They contain a slight nutty flavor and deep earthiness that, if you are a fan of asparagus or artichokes, will prove to be quite tasty. In order to get the most out of your purchase, be sure to always buy fiddleheads that are bright green and tightly coiled, as this means they are still quite fresh. That being said, if the ends are getting a bit brown and old, simply snap them off like you would when preparing asparagus. Overall, today’s recipe is one that is getting “back to the basics,” at it is truly one of the quickest and simplest ways to prepare fiddleheads. If you are looking for an even simpler method, skip the sauteeing and head right for the oven. Of course, yours do not have to end up looking as shriveled as the pictures of mine do, however, my family prefers their roasted vegetables quite crispy. Either way, fiddleheads serve as yet another way to expand your palate and try new, exciting foods. Thoroughly wash ferns, snap off any brown ends, and dry completely. Heat duck fat in a pan and heat on medium-low until hot. Add ferns and sautee 3 minutes on medium-low, then add in white wine vinegar, and remove the pan from the heat. Transfer pan to 450 degree oven and roast for 13 minutes until beginning to brown and become crispy. I’m so jealous! Fiddleheads are on my wish list of foods to try, but I haven’t been able to find them locally. Someday!